Unwanted hair be gone! Remove hair delicately and easily from head to toe with all-in-one convenience and sleek, satiny style. The Conair Satiny Smooth All-in-One Facial Trim System makes it safe and easy to get rid of any unwanted hair on your face or anywhere on your body. This ladies hair remover can also be used to trim delicate areas for smooth, beautiful and nick-free results. 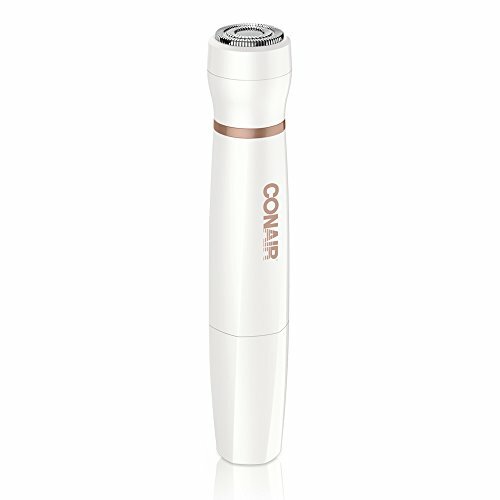 Conair's advanced wet/dry personal hair trimmer for women is delicately designed for use in and out of the shower. The hypoallergenic foils on this professional hair trimmer are perfect for sensitive skin and help reduce any irritation. This multi-purpose ladies trimmer has a 5 versatile attachments, including a rotary shaver to help remove unwanted facial hair on delicate areas like upper lip, chin or cheeks, a multi-use hair trimmer for a close comfortable shave on your legs, underarms or bikini area; an eyebrow trimmer for shaping and sculpting the perfect brow; a detail comb for custom grooming; and an eyebrow comb to finish, groom and define brows. This ladies trimmer in beautiful white and rose gold, features a sleek and compact design, making it perfect for easy storage and traveling. It’s so discreet and portable you can even throw it in your purse for touch-ups anywhere and on-the-go. It includes a convenient storage pouch and is cordless and battery operated (requires 1 AA battery) for hand-held all-over use. The Conair Satiny Smooth All-in-One Facial Trim System is the only ladies personal hair remover you’ll need.